It’s no secret that today’s attackers have the resources, expertise, and persistence to compromise any organization if given enough time. Traditional defenses, including firewalls and endpoint antivirus, no longer work against these attacks. 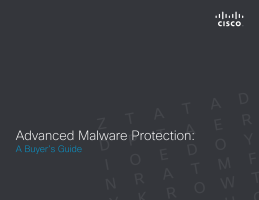 The process of handling malware must evolve -- and quickly at that. To have any chance of effectively defending against modern-day attacks, the solution must use continuous analysis and big data analytics to track file interaction and activity across the network, in physical and virtual environments, and on protected endpoints and mobile devices.